Roy Ellis already brilliant as a ten-years old solo singer in the Children -Gospel choir in the Baptist Church in Kingston-Jamaica. In his school-days he developed a strong friendship with Jimmy Cliff, and also Bob Marley belonged to his circle of friends. Later in the ' 60 's in England & in middle Europe, he made himself with his giant voice an international name in the Ska, Reggae, Gospel, Blues, Soul scene. Roy Ellis was also the lead singer from one of the most famous British-Ska, Reggae, Gospel, Blues, Soul, funk Band: The Pyramids/Symarip. In the ' 60`s he`s one of the pioneer for the Ska and Reggae music in England,and Middle Europe. 1966 He was discovered by the "Godfather of Ska", Laurel Aitken , who wrote 2 songs -Jesse James rides again, and because I love you, and also was produced by him. 1970 The documentary flim "REGGAE" was flimed in the Wembley-stadium. 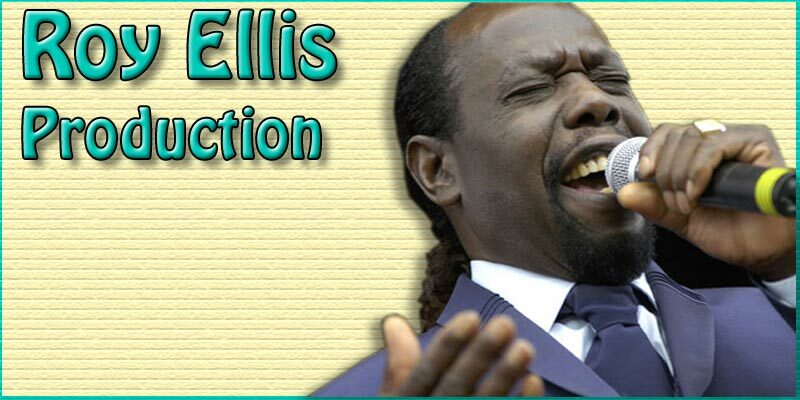 Roy Ellis interpreted the Ska & Reggae Music and also Gospelsongs in Reggae style. 1971 Sang Roy Ellis his blues-characteristic compositions See you later, and To father, in the film "WARM DECEMBER". the star performer was the magnificent film actor Sidney Poitier. Throughout Europe Roy Ellis is a celebrated singer and intertainer. Roy Ellis is known for one of the best impersonator of James Brown and Barry White. 1973 Roy Ellis is one of the first Ska, Reggae, Gospel- & Soul singer in Switzerland. Since 1980 Roy Ellis lived in Switzerland and, in 1988 he became a holder of the Swiss nationality. 1994 Roy Ellis was a guest singer by the Bo Katzmann Choir Christmas tour, that was transmitted also by the Swiss TV. 1995 Roy Ellis appeard on the SwissTV Music& quiz program Megaheart with his own composition Switzerland is beautiful. 1997 Roy Ellis appeard with Bo Katzmann in theSwisTVMusic program "Takito" and also as a guest Gospelsinger on the Celine Dion Swiss tour. 1998 Roy Ellis sang in the Background-choir of the Swedish Mega-Star's Ace of bases in the Swiss TV Music & Quiz program Megaheart. Roy Ellis im Background-Chor von den schwedischen Mega-Stars Ace of Base. 1999 Roy Ellis with his Gospelchoir, The Angel-Singers who accompany Tina Turner, PhillCollins, FrancinJordi, in the popular Swiss TV.family program Benissimo. 2004 Roy Ellis appeard with Phill Collins, on the Swiss family TV program Benissimo. Plus many local TV - and radio interviews. At 12. Juni 2009, Roy Ellis and the Angel-Singers performed at the wedding of Boris Becker's and Lilly Kerssenberg's in St. Moritz.